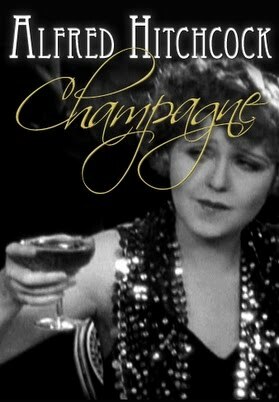 “Champagne” is a silent comedy film directed by Alfred Hitchcock, based on an original story by English writer and critic Walter C. Mycroft. The film is about a young woman forced to get a job after her father tells her he has lost all his money. Heiress Betty (Betty Balfour) draws the ire of her father after using his airplane to fly to her boyfriend (Jean Braden) on an ocean liner headed to France. She has dinner alone when her boyfriend becomes seasick and is joined at her table by a mysterious man. Betty receives a telegram from her father who disapprovingly warns her the boyfriend is a golddigger. To prove her father wrong she asks the boyfriend to marry her. A quarrel ensues and the two part company when the ship docks. The boyfriend regrets the fight and goes to Betty to apologize. He finds her entertaining guests, including the mysterious man. Another quarrel between the two is interrupted by the arrival of Betty’s father (Gordon Harker). He tells Betty the family fortune, earned in the “champagne” business, has been wiped out in the stock market. The boyfriend leaves after hearing the news of their fortune. The father sees this as proof the boyfriend is only after money. Betty decides to sell her jewelry but is robbed en route to the jewelers. Now penniless Betty and her father move into a small shabby apartment. Unbeknownst to Betty her father sneaks out to eat at an expensive restaurant after her cooking proves to be terrible. Once again her boyfriend tries for a reconciliation but is rebuked by Betty, who now thinks her father is right about the boyfriend, vows to get a job. Betty finds work at a swank restaurant. Soon the mysterious man shows up and invites Betty to his table. She becomes uncomfortable with the stranger and is relieved when her boyfriend once again arrives. The mysterious man leaves after handing her a note that advises her to call him if she ever needs any help. The boyfriend openly disapproves of Betty’s job. He leaves after a still angry Betty dances wildly to provoke him. The boyfriend soon returns with Betty’s father. He is outraged at Betty’s “unseemly” job and confesses he lied about the loss of their fortune to teach her a lesson. Rather than being pleased, Betty is further angered by both the father and the boyfriend. She turns to the mysterious man who offers to take Betty back to America. Betty gladly accepts but is later horrified to find she has been locked in her cabin. She imagines the worst about the mysterious man’s intentions and is both relieved and delighted when her boyfriend arrives yet again and releases her from the cabin. They soon reconcile. The boyfriend hides in the bathroom when they hear the mysterious man approaching. He enters with her father who confesses he hired the man to follow and protect her. The boyfriend is furious and comes forth to attack the man. Betty’s father pacifies the boyfriend’s anger by telling him he no longer disapproves of their wedding. The reunited couple start discussing the wedding when once again another argument starts. The film has different names in various countries. The original UK title is “Champagne”. In France the film is known as “A l’américaine” and “Palace de luxe”, in Hungary the name of the movie is “Pezsgő” and in Italy the name is “Tabarin di lusso”.